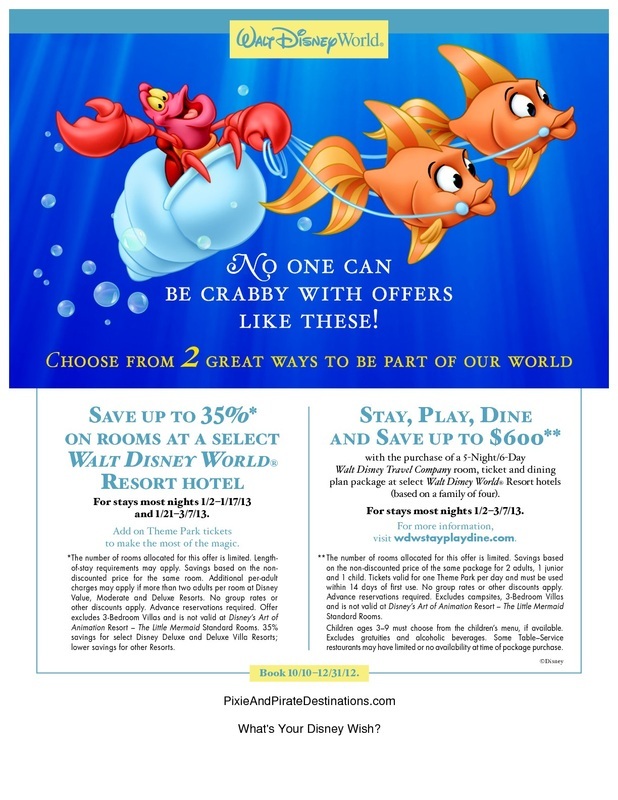 Disney World 2013 Stay Play and Dine - Pixie & Pirate Destinations *|* Wishes become memories. One dream at a time. Now through Dec. 31, 2012, purchase this 5-night, 6-day Walt Disney Travel Company room, ticket and dining plan package at select Walt Disney World® Resort hotels for arrivals most nights Jan. 2 – March 7, 2013, and save up to $600*. Sample Pricing: Buy this 5-night, 6-day room, ticket and Disney dining plan package at a select Disney Moderate Resort in a Standard Room for stays most nights Jan. 2 – March 7, 2013, and pay a package price of $2,429 for a family of 4. That's a savings of $633! Ask about packages in other Resort categories. Offer ends December 31, 2012. Contact us today to get started!